In early 1935, General Secretary Josef V. Stalin ordered the Red Navy to draft plans for a massive fleet based around large battleships. The Second Five-Year Plan, already under way, had called for huge coastal-defense forces. Under the Third Five-Year Plan, that would be extended to sea control far beyond Soviet shores. Technical assistance, armaments, plans and even entire warships were pursued or purchased in Germany, Italy and the United States. Powerful battleships armed with the heaviest guns would be the fleet's backbone, with flocks of cruisers and destroyers to support them. A few aircraft carriers were acceptable for scouting purposes, Stalin allowed, but would never amount to a major weapons system. A future war, Soviet naval planners believed, would pit the Soviet Union against the fascist states of the Axis plus their sympathizers. The capitalist democracies would probably hold to a neutrality favorable to the Soviet Union's enemies. In the Black Sea, the Red admirals ("flagmen" in the pre-war egalitarian rank structure) believed the Italian navy would join with the Turks and operate against Soviet ports. A powerful fleet would be needed to first defeat this aggression, then to seize the Turkish Straits leading into the Mediterranean and project power into that region. 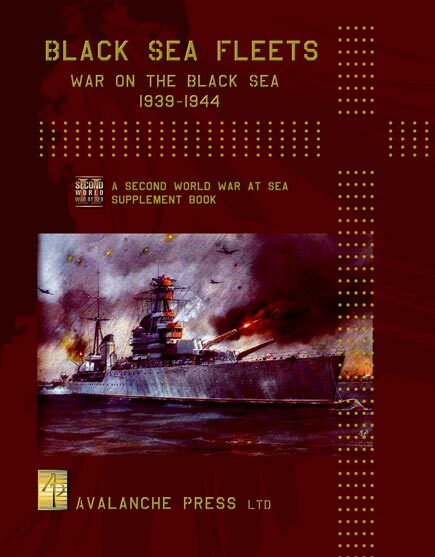 Black Sea Fleets is a 64-page supplement for the Second World War at Sea series. It covers Stalin's plans for a dominant fleet in the Black Sea, plus the fleets and naval air forces of Turkey and Romania. Background articles cover Soviet shipbuilding plans, the Soviet naval air forces, the Second World War campaigns on the Black Sea, Turkish and Romanian fleets and plans for larger ones, and more. Scenarios cover both the actual operations in the theater and the campaigns foreseen by the Soviet staff in their assessments before, during, and after the Second World War. Like East of Suez, Black Sea Fleets includes die-cut, mounted game pieces: 70 "long" ship pieces and 140 standard-sized pieces, most of them representing aircraft. There are battleships like Parizhaya Kommuna, Novorossisk and Sovietskaya Ukraina, the battle cruiser Sevastopol, several proposed aircraft carriers, plus cruisers and destroyers ranging from re-conditioned veterans of the Tsarist navy to the "Blue Beauty," the destroyer leader Tashkent. Romania has her long-desired cruiser, while Turkey fields the battle cruiser Yavuz plus the ships she desperately sought to buy in the 1930s. Aircraft range from the PZL-11 fighter in Turkish service through Romanian Fi.167 torpedo bombers to the Soviet I-15 biplane fighter and IL-2 Sturmovik attack plane. Players will need Bomb Alley to enjoy almost all of the scenarios in Black Sea Fleets, and Leyte Gulf to enjoy the rest of them.